Thought experiment, how would you play out a conflict between two nuclear powers where the Prime Minister facing election in one of them vows to “avenge very tear” caused by a terror attack in the Kashmir linked back to the other nation? Throw in that the other nation has the tacit support of China, Russia, and Saudi. Clearly, India is weighing military options on its neighbor Pakistan. Now think about what global share markets might do? Rally, of course, as the bigger concern is about US/China trade relations and talks continue as they shuttle back to Washington from Beijing last week. The leaked hope being that the US takes up Xi on a deal to eliminate the US deficit by importing more goods and commodities by 2025. Markets like people have personality and we are in the Sanguine rather than Choleric state. The confidence game at play is clear even as the markets are thin with US and Canada holidays. Central bankers are widely expected to keep the taps open for liquidity, and bad news whether geopolitical or economic has quickly been cast aside. This is about greed not fear. The ugly weakness in China auto sales highlights the downside risks ahead where pumping money into banks and construction plans doesn’t feed the Chinese consumer. The rally up in Chinese shares (the best day in 3-months) reveals more about trade talk hopes and stimulus working than about geopolitical risks blowing up. 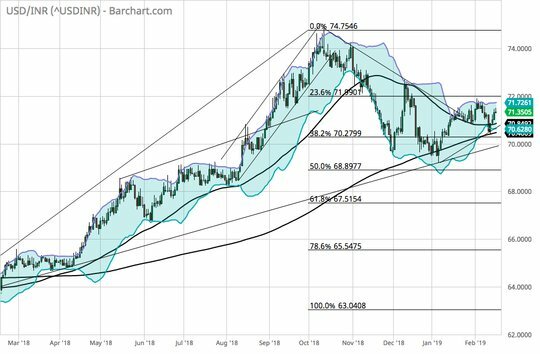 We are in a market where looking at the pain trade matters – and so for FX its all about the INR with an election, a potential military conflict, oil prices and central bank independence all at risk – yet the chart isn’t flashing red but yellow – watching 74 for bears to be proved right or 69 for a bull run to return. Question for the Day: Is any deal with China good for markets? The pricing of risk in the last 8 weeks has been connected to expectations that the US and China come to terms over trade. It has also been supported by the view that the FOMC and other central banks do nothing more towards tightening, with some looking or easing next. These two factors explain much of the price action. They beg the question about the medium term risk for many see a bad deal between Trump and Xi leading to larger problems later and others will point out that FOMC patience is more a collar than a free S&P500 put where higher inflation or asset prices will trigger further rate hikes. Clearly, the two are connected by what happens to financial conditions. The S&P500 is just 5% away from its record highs. Yet economic data is less convincing. The FOMC balance sheet maybe the more important consideration for risk in the week ahead with FOMC speakers and minutes shedding light on their thinking there.